Keeping your work, family, and personal calendars in one place can cause privacy issues when you want to share your schedule with others. Teamup can help. It’s good to keep track of one aspect of your life with a calendar. It’s even better to keep track of all major areas of your life on one calendar. 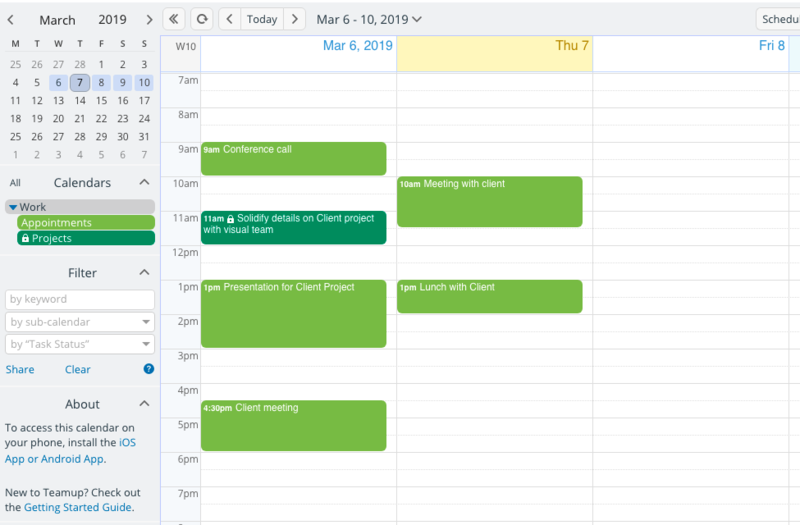 With a single, centralized calendar, you can note potential conflicts, avoid double-booking yourself, and space out activities in one area when you’re very busy in another area. 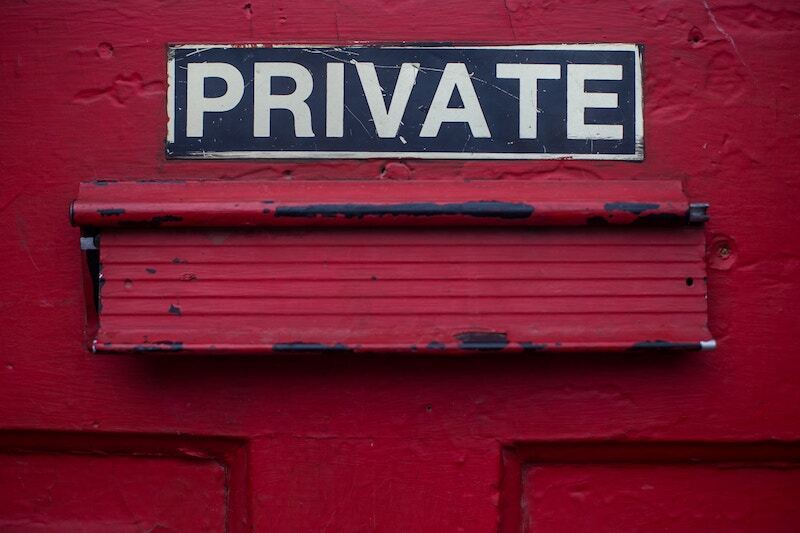 However, there’s an element of privacy that can be a problem. For example, if you keep your work and personal schedule on one calendar, how do you share your work calendar with an assistant, but protect your personal schedule and information? Or, on the other hand, perhaps you want to share your personal calendar with your family members, but don’t want work or client information to be shared. Setting up one calendar for work, and one for personal needs. They have to check both calendars to keep up with the big picture of their entire schedule. Managing work and personal schedules on one calendar. They can send invitations to individual events, but allowing full calendar access creates privacy issues. Both scenarios come with severe limitations. In the first scenario, there’s no easy way to see a big-picture view that includes all the major areas of your life. In the second scenario, delegating and collaborating becomes difficult if you can’t really share a full calendar with someone on your team or in your family. Teamup provides a better solution for this issue. With Teamup, you can create individual sub-calendars and assign them to different areas, projects, or parts of your life. The multi-calendar or sub-calendar feature isn’t uncommon among calendar services. The ability to share your sub-calendars selectively, with anyone, is very special. With Teamup, you can grant access to a specific sub-calendar or set of sub-calendars to anyone with a single URL. This means that you could create a master Teamup Calendar with a set of sub-calendars for work and a set of sub-calendars for your personal life. Then, you can create unique calendar links to share your calendar with others; you choose which sub-calendars to include on each link. Create a unique calendar link that includes all of your work sub-calendars for your work assistant. Create a calendar link with family and some personal sub-calendars for your partner. Involved in a hobby? Create a sub-calendar for your hobby meetings and activities, and share only that sub-calendar with your hobby group. Create a calendar link with only your main family sub-calendar for your children. In addition to choosing which sub-calendars to include on each calendar link, you also get to choose what each person can do on each shared sub-calendar: read only, see details or not, add events, modify, and more. Teamup has nine different levels of access permissions, so you can customize exactly what’s is appropriate for each sub-calendar you share. Let’s use Marci as an example. She has a set of sub-calendars for work, a set of sub-calendars for her personal life and interests, and a set of sub-calendars for her family. All of Marci’s sub-calendars, organized in folders. Marci’s calendar includes all of her sub-calendars and events. She can toggle sub-calendars off and on in her view as needed. Marci creates a calendar link for her assistant that includes all of her work sub-calendars. For her Appointments sub-calendar, she gives her assistant Modify access. Her assistant can add meetings, update appointment information, or delete canceled events on the calendar. For her Projects sub-calendar, she gives her assistant Read-only access. Her assistant can see all the events and view the event details, but cannot add to, modify, or delete anything on the project sub-calendar. Her work assistant’s calendar includes only the sub-calendars that Marci shared. Marci creates a calendar link for her partner that includes her family sub-calendars and her Appointments sub-calendar for work. For her Appointments sub-calendar, she gives her partner Read-only, no-details access. This permission level shows events on the calendar but does not include any details. That way, her partner can see when Marci is busy in a meeting or appointment, but Marci is not sharing sensitive client or work information outside of a work context. For her family sub-calendars, Marci gives her partner Modify access. Her partner can see and edit all events and can add new events to the calendar, as well. She also shares Read-only access to her personal sub-calendar for cycling, so her partner can see when she has training or events with her cycling team. Her partner’s calendar includes the selected sub-calendars. The work calendar shows no details, only events marked as Reserved. Marci creates a calendar link for her son. She includes all family sub-calendars. For the main family sub-calendar, she gives her son Add-only access. He can add new events to the calendar, and he can modify or delete them within a certain time window. He cannot modify or delete any other events on the calendar. For his individual sub-calendar, she gives her son Modify-from-same-link access. He can add events to the calendar, and modify or delete them as needed. But he cannot modify or delete other events on the calendar. Marci creates a calendar link for her cycling club. It includes only her personal sub-calendar for cycling. She gives her cycling club an Add-only link so they can add their own rides, events, training sessions, and other cycling opportunities to the calendar. When you share the unique calendar link with others, they only see the sub-calendars you’ve chosen to include in their link. But you can see all your sub-calendars in one place. It’s much easier to do wise planning and make good decisions when you can see every part of your life. The Scheduler view is helpful for comparing schedules, events, and commitments from various parts of your life. The Year or multi-month view is excellent for long-term planning. Customize the Multi-week and Multi-day views for the way you like to plan. Multi-day can show 2 to 6 days at a time. Multi-week can show 1 to 12 weeks at a time. The Agenda view works well for seeing your day at a glance, or for viewing itinerary for a trip or milestones and tasks for a project. You can also change or remove calendar sharing at anytime. You can delete or disable a calendar link if you no longer want to share your calendar with an individual or group. Or you can update it, adding or removing sub-calendars or changing the level of permission as needed. The beauty of Teamup is that it’s built to be customizable for your needs: the way you actually work, think, and plan. Why not give it a try today?